India has set out some of the world's most ambitious renewable energy policies, including a target to ramp up solar installed capacity to 100 GW by 2022. Strong and clear policy signals, especially in the clean energy sector, demonstrate India's leadership and continue to fuel optimism on sustained climate action. 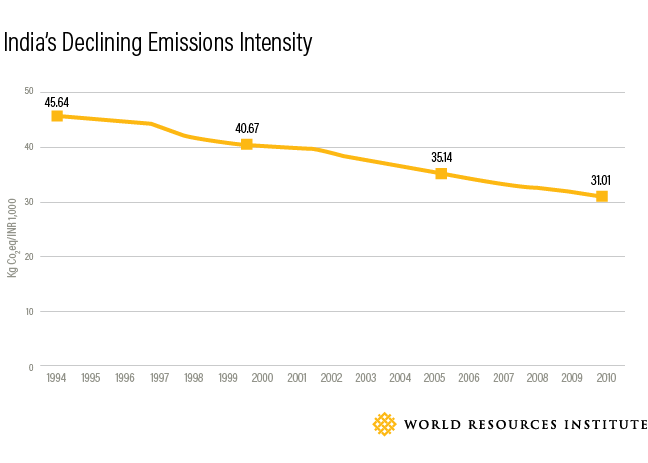 In 2015, India committed to reduce the emissions intensity of its GDP by 33 to 35 percent below 2005 levels by 2030. New WRI research, Pathways for Meeting India's Climate Goals, shows that the country can achieve this GHG mitigation goal through the existing policies we analysed, while maintaining annual GDP growth rate of 6 to 7 percent. By further enhancing 5 key policies and actions, the country can reduce the emissions intensity of its GDP by around 43 percent by 2030, relative to 2005 levels. The implementation of these policies will also deliver significant development benefits, such increasing household income, reducing air pollution, increasing jobs and creating new investments in environmental projects. For example, the study finds that these policies will increase income of rural and urban households in the range of 3 to 5 percent by 2030. This supports India's overall approach to tackling climate change within the context of sustainable development. The analysis and results are underpinned by a model developed by KPMG India Private Limited, which simulates the interactions among the economy, the energy systems, and the environment, and projects the GHG emissions for India until 2030 under different policy scenarios. However, some institutional, financial and technical challenges still need to be overcome, which include unexpected cost escalations, challenges in the enforcement of policy instruments and inadequate governance structures. Looking ahead, the government agencies responsible for implementing India's climate policies will have a critical role to play in overcoming these challenges and providing an enabling environment to ensure policy success. Capacity building—coupled with technology transfer and low-cost international finance—will be equally important for delivering India's climate goals.